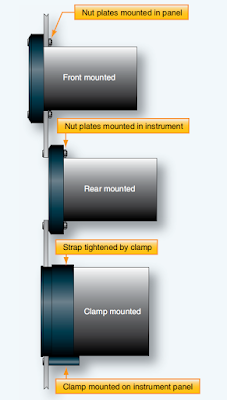 The type and number of shock mounts to be used for instrument panels are determined by the weight of the unit. 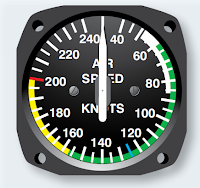 Shock-mounted instrument panels should be free to move in all directions and have sufficient clearance to avoid striking the supporting structure. When a panel does not have adequate clearance, inspect the shock mounts for looseness, cracks, or deterioration. Instrument panel layout is seemingly random on older aircraft. The advent of instrument flight made the flight instruments of critical importance when flying without outside reference to the horizon or ground. As a result, the basic T arrangement for flight instruments was adopted, as mentioned in the Flight Instruments [Figure 1]. Electronic flight instrument systems and digital cockpit displays have kept the same basic T arrangement for flight instrument and data presentations. The flight instruments and basic T are located directly in front of the pilot and copilot’s seats. Some light aircraft have only one full set of flight instruments that are located in front of the left seat. Flight instruments directly in front of the pilot, engine instruments to the left and right, and navigation instruments and radios primarily to the right, which is the center of the instrument panel. This arrangement is commonly on light aircraft to be flown by a single pilot. On modern aircraft, EFIS and digital flight information systems reduce panel clutter and allow easier access to all instruments by both crewmembers. Controllable display panels provide the ability to select from pages of information that, when not displayed, are completely gone from view and use no instrument panel space. The method of mounting instruments in their respective panels depends on the design of the instrument case. In one design, the bezel is flanged in such a manner that the instrument can be flush mounted in its cutout from the rear of the panel. Integral, self-locking nuts are provided at the rear faces of the flange corners to receive mounting screws from the front of the panel. The flanged-type instrument can also be mounted to the front of the panel. In this case, nut-plates are usually installed in the panel itself. Nonferrous screws are usually used to mount the instruments. 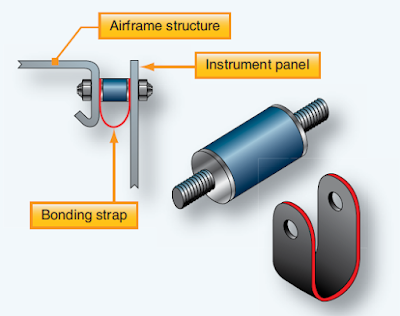 There are also instrument mounting systems where the instruments are flangeless. A special clamp, shaped and dimensioned to fit the instrument case, is permanently secured to the rear face of the panel. The instrument is slid into the panel from the front and into the clamp. The clamp’s tightening screw is accessible from the front side of the panel. [Figure 3] Regardless of how an instrument is mounted, it should not be touching or be so close as to touch another instrument during the shock of landing. Many aircraft instruments require electric power for operation. Even nonelectric instruments may include electric lighting. Only a limited amount of electricity is produced by the aircraft’s electric generator(s). It is imperative that the electric load of the instruments, radios, and other equipment on board the aircraft does not exceed this amount. Electric devices, including instruments, have power ratings. These show what voltage is required to correctly operate the unit and the amount of amperage it draws when operating to capacity. The rating must be checked before installing any component. Replacement of a component with one that has the same power rating is recommended to ensure the potential electric load of the installed equipment remains within the limits the aircraft manufacturer intended. Adding a component with a different rating or installing a completely new component may require a load check be performed. This is essentially an on the ground operational check to ensure the electrical system can supply all of the electricity consuming devices installed on the aircraft. Follow the manufacturer’s instructions on how to perform this check. 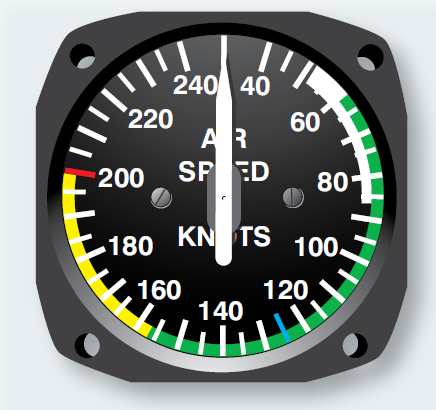 Many instruments contain colored markings on the dial face to indicate, at a glance, whether a particular system or component is within a range of operation that is safe and desirable or if an undesirable condition exists. These markings are put on the instrument by the original equipment manufacturer in accordance with the Aircraft Specifications in the Type Certificate Data Sheet. Data describing these limitations can also sometimes be found in the aircraft manufacturer’s operating and maintenance manuals. Occasionally, the aircraft technician may find it necessary to apply these marking to an approved replacement instrument on which they do not appear. It is crucial that the instrument be marked correctly and only in accordance with approved data. The marking may be placed on the cover glass of the instrument with paint or decals. A white slippage mark is made to extend from the glass to the instrument case. Should the glass rotate in the bezel, the marking will no longer be aligned properly with the calibrated instrument dial. The broken slippage mark indicates this to the pilot or technician.